It seems that the idea that Giants walked on Earth is a possibility being considered by more people in the last couple of years. Due to the number of mysterious findings around the world, a large number of researchers is considering the possibility that these ‘mythological’ beings actually existed on Earth in the distant past. Stories and tales about gigantic beings inhabiting Earth occur in almost all ancient cultures and civilizations. We can find stories in many mythologies of the ancient world: Greek, Norse, Germanic, Indian, Indo-European, and also in the new world as in the traditions of the Mayans, Aztecs and Incas; but most importantly in almost all mayor sacred books of antiquity: the Lebhar Gabhale, the Hindu Ramayana and even in the Bible. The long lost “Fallen Angels” the Nephilim? The Smithsonian Institute has been accused by many people of deliberately hiding discoveries that could potentially alter the views society has on history and life on Earth. “Madison was in ancient days the center of a teeming population numbering not less than 200,000,” the Times said. 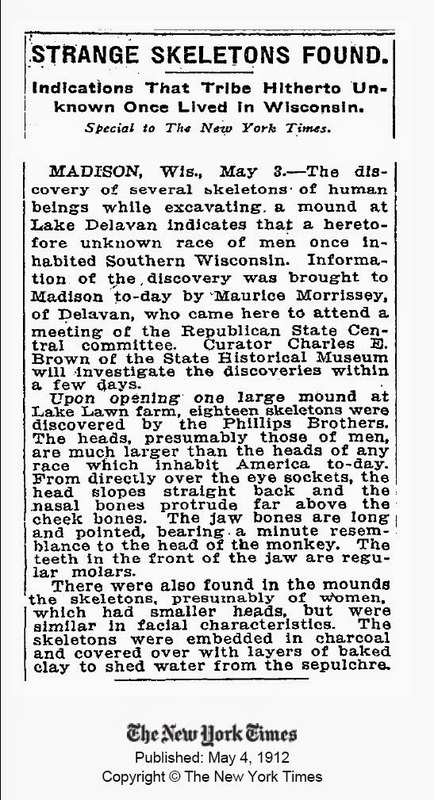 In 1870 the Wisconsin Decatur Republican wrote an article about two well-preserved giant skeletons of an unknown race discovered near Potosi. We cannot forget to mention the 200 million year old Giant Footprint found in Africa that hasn’t been explained by researchers who have tried very hard to ignore it since it could potentially rewrite history as we know it.